Today, to coincide with the launch of the government’s report on its Review of the Mental Health Act, we are launching an alternative review. We believe this is important as the Mental Health Act has a profound impact on the lives of our members and supporters, many of whom have either been detained under the act, witnessed the detention of a loved one or lived under the threat of detention. In view of serious concerns about the neglect of service user led groups within the review process, we conducted an event for over 100 of our members, coupled with a survey, to find out what changes they wanted to see. The report is the culmination of this process. Sharing the report (on social media (#AlternativeMHAReview), with group members, with family/friends/colleagues, with your MP etc). Contributing your experiences and perspectives to the discussion – either on this page, on social media or in the ‘non-virtual’ world. It will be so easy for the issues raised by either of the mental health act reviews to get lost in the current political climate (where Brexit dominates the news). Let’s try and work together to keep the debate live and reach as many people as we can. The Mental Health Act (MHA) is not fit for purpose and needs to be radically overhauled for the 21st century. This is not the time to sweep key issues under the rug, or rush through timid changes which fail those most vulnerable to the use of the MHA. We call for a bold and ambitious rights-based approach to the Mental Health Act and its Code of Practice. At the heart of this endeavour is centering service users and survivors. Whilst we acknowledge the challenges and complexities around the process of creating the MHA Review, and the conviction, integrity and heart of those who contributed to the process, we also believe that the MHA Review has been a missed opportunity. We held an event on the MHA Review in April 2018 for over 100 of our members and supporters, and conducted a survey with them to elicit their views on the changes they would like to see in mental health legislation. Six main themes emerged: enshrining a rights-based approach in the legislation and practice; acknowledging both the institutional abuse and the institutional racism at the heart of the mental health system; ending Community Treatment Orders; making Advance Decisions which relate to Electro-Convulsive Therapy and medication, entirely binding; and creating and funding meaningful alternatives to detention. The MHA and the Code of Practice should enshrine a rights-based approach. Reflecting the views of our membership, we recognise the need for short-term detention (under 72 hours) in extreme circumstances. This should be understood as a grave decision of last resort, having exhausted all other options and should take place with the most stringent of safeguards. We call for an end to longer-term detention under the Mental Health Act in order to administer treatment, including forced medication. This can only take place alongside the implementation of a meaningful range of well-funded alternative mental health and social support. We call for the abuse of service users who are detained under the MHA, to be acknowledged as a systemic, institutional issue, which needs to be addressed in multiple ways. This should include a review of the complaints procedures to ensure they are simple, transparent and effective, and that service user testimonies are not de-legitimised. We also call for an acknowledgement of the institutional racism at the heart of our mental health services, without which we will not be able to address the disproportionate number of racialised minorities who are subject to the Act. In line with the evidence, we advocate for an end to Community Treatment Orders, which have not been shown to reduce detention. Advance Decisions which are made when capacitous, and which relate to Electro-Convulsive Therapy and medication, should be entirely binding. Finally, we believe that meaningful changes to the MHA can only take place alongside the creation and funding of services and alternatives to detention that people want to use when they are distressed. Loukia is looking for participants for the following study and has contacted HVN to ask if we would circulate it. If you are interested in taking part or know someone who is, please contact them directly to find out more information. The study is independent to HVN. They have agreed to share the outcome of the research with us, and we will publish it when we are able to. We invite you to take part in the research project “Experiences of mystical among people who hear voices, see visions or who have had extraordinary experiences” which is conducted by Chaidemenaki Loukia under the supervision of Dr. William Van Gordon, lecturer in Psychology and University of Derby, UK. What is the aim of this research? People who have had mystical experiences or hear voices, see visions or have had extraordinary experiences are able to participate in the research. Criteria for participation are mainly having interest for spiritual, religious, transcendent, artistic matters and so-called mystical experiences, having/or have had experienced mystical experiences. However, people who have or have had mystical experiences under substance intoxication, have a recent mental health disorder diagnosis and are under 18 years old are not able to participate in the research. At first, you need to declare your interest at the end of this document by giving your e-mail. Then, the researcher will contact you in order to arrange a short screening via skype with you in order to explain more about the research aims and for you to discuss your motivation and relevance with the research topic. After completing this, you will be sent an online consent form and go through an online one-to-one interview with the researcher. The interview questions will be relevant to the area of interest of the research. The discussion will take 20–30 minutes maximum. After completing the interview process you will have the opportunity to ask questions about the research topic. Will I be affected in any way? There are no known risks (psychical or psychological) resulting from the study. The discussion will be conducted in a sensitive, warm and empathetic way. Will I be able to withdraw from the research? If any issue arises during or after the process, you are able to withdraw at any point and until two weeks after the interview date by contacting the researcher in the given contact details. A referral list and contact details of the researcher will be also provided for any further information regarding the research. Will my information given be kept confidential? Your data will be kept confidential. You will be asked to provide a Unique identification Code with which your data will be stored. Furthermore, you will be addressed throughout the research processes with a pseudonym. The interview will be audio-recorded. The recording will be solely for internal use by the researcher to analysis of the relevant information. The information provided will kept up to 7 years. After this time period, all data provided will be destroyed. The researcher, the research team and academics at the University of Derby will have access to the information provided. How will the information provided be stored and used in the future? The recordings and information provided will be kept at the absolutely secured in an electronic file accessible only by the researcher. They will be only used for writing up the research report. A part of the research report might be used for other scientific purposes such as publication scientific journals. Participants’ data used in the analysis will be addressed using a pseudonym. Has the research been ethically approved? Yes, the research has been designed based on the British Psychological Society Code of Ethics and approved by the Ethics Committee for psychological research of the University of Derby. Will I receive any rewards from my participation? No, there is no financial reward from participating in the research. Your participation is entirely voluntary. If I need further information to whom shall I refer to? In this one day event, we invite you to join us to explore the mental health act from a human rights perspective. We will be creating space for discussion, reflection and exploration of the impact the Mental Health Act has had on each of us (and those we care about), and the changes you would like to see happen in the forthcoming review. Featuring: Nimisha Patel, University of East London and other contributors TBC. This event is FREE for all current HVN members (individual or group). Our AGM takes place after the conference from 5 – 5.30pm. Members of National HVN and interested others are welcome to attend, whether they attend the conference or not. Email info@hearing-voices.org for more info. The following is a message we have received from Candace, an assistant producer at Blakeway about an upcoming documentary. As always, use your own judgement as to whether you wish to talk with her. If in doubt, speak with someone whose judgement you trust before contacting her. If you are interested, please contact Candace directly. Made for the young BBC Three audience, but also to potentially air on BBC One, it will be filmed from the perspective of voice hearers, to bring to life their very distinct and individual experiences and perceptions of the world. Through people’s extraordinary stories this film aims to recreate the experience of hearing voices, providing insight into the daily challenges faced by voice hearers; the highs, lows and everything in between – tackling common misconceptions, stigma and lack of understanding so often associated with hearing voices. We pride ourselves in making films collaboratively, so we would like to speak to as many young voice hearers as possible in order to reflect their experiences. At this stage, we are not asking for a commitment from anyone to being filmed – but we do hope to hear from as many young adults (under 35) who hear voices as possible. Any conversations we have will of course be in strictest confidence and would be very informal, there’s absolutely no expectation for you to be involved further in our documentary, or to be filmed. Even those who do not wish to be filmed may have incredibly valuable ideas that will shape the way the documentary is made. If you’d be happy to have a chat with me and share some of your experiences and insight into hearing voices, please drop me an email or give me a call on the numbers below. To give you a bit of background on our company, Blakeway North is an award-winning Manchester based company. We make sensitive factual programmes for the BBC, Channel 4 and numerous other broadcasters. We have won Production Company of the Year at the Prolific North Awards three times. Please have a look at our website to see examples of our most recent work: http://www.blakewaynorth.co.uk/our-work. Thanks so much for taking the time to read this, I look forward to hearing from you! Rai, one of our trustees, is currently recruiting young people (aged 12-16) with personal experience of hearing voices to take part in a research study. Rai is doing this study independently from the Hearing Voices Network, as part of her course. She is not acting as a trustee whilst she is doing it. Take a look at the information, below, to find out more. If you, or someone you know, is interested in taking part – please contact Rai directly. If you’re aged under 19 and are looking for support, remember you can contact Voice Collective (www.voicecollective.co.uk) – a project that specialises in supporting children and young people who hear voices, see visions or have other similar experiences. Voice Collective also offer support for parents and family members. Can you help us learn more about what it’s like to talk, or not talk, with other people about the voices you hear? Hi. My name is Rachel (Rai) and I am studying an MSc by Research in Psychology at Canterbury Christ Church University. I hear voices myself, but didn’t tell anyone about my experiences until I was an adult. I’m doing a research study to understand more about young people’s experiences of talking, or not talking, with others about voices. Who can take part in this study? People hear voices for all kinds of reasons. Some people who hear voices may also have a diagnosis of a mental health problem. Some may not. You are welcome to take part in this study whether you have a mental health problem or not. I’m interested in your experiences and how you understand them. If you decide to take part, I will arrange to meet with you to talk about your experiences of hearing voices and talking about it to other people. I will bring some photos as, if you like, you can use them to help you explain how you feel. If you are aged under 16 you may need the consent of your parent or guardian to take part. I can reimburse travel costs and can also offer a £10 high street shopping voucher in thanks for the time you have taken to take part in this research. We’re excited to announce that we’re running a free one day conference in London in association with the British Psychological Society. Please download and share our flyer and encourage anyone you think may be interested to come along. This free* one day conference, supported by the BPS, provides an opportunity to explore the value of, and problems with, psychiatric diagnosis. Using some alternative ways of understanding, and responding, to emotional crises without diagnosis as inspiration, we will explore some of the challenging personal and social implications of moving beyond psychiatric diagnosis. This is not a conference aiming for a single unified voice – it provides a welcoming space to explore these issues. 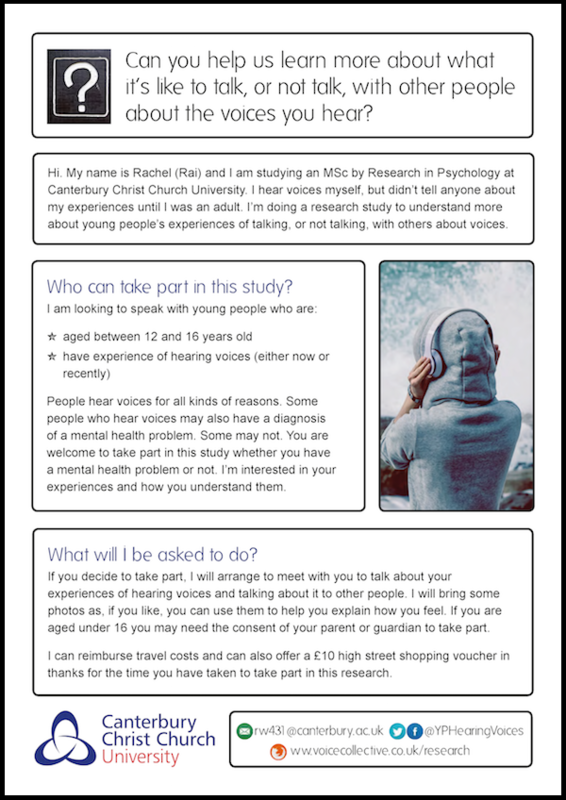 We have had a request from Kirsty, from UCL, to advertise this study she is undertaking on hearing voices. She has had the support of Eleanor Longden in developing this, however it is independent from HVN and it’s important that you read through the participant information carefully and get in touch with Kirsty or her supervisor Chris if you have any questions. “Hearing voices” is an experience where person has a strong perception of hearing a voice that is not identified as being their own internal voice, and does not originate from another person nearby. You are not alone. It’s estimated that between 3-10 percent of the population hear voices. Furthermore, there are support networks available to people who have these experiences in the UK (Hearing Voices Network) and internationally (Intervoice). For those who experience the phenomena of hearing voices, it can be extremely distressing and have a major impact on their ability to go about daily life. Recently, psychological research has begun to explore the phenomena of voice hearing in more depth. By more fully understanding these experiences, the better the psychological and voice hearing communities become at managing and overcoming these experiences. Other research has addressed the occurrence of voice hearing across multiple psychiatric conditions and the characteristics or properties that may be associated with the voices heard. However, our study is unique in that we are attempting to gather examples of what exactly a person hears when they hear voice. From these examples we intended to analyse the properties of the language used and how these properties may relate to the characteristics of that voice. A study of this kind has not yet been conducted and we are hopeful that it may give us a great insight into the phenomena of hearing voices by more fully understanding exactly what the voices say. All data collected by this study will be stored in accordance with the provisions of the Data Protection Act 1998. If you would like to lead a workshop, REV France would love to hear from you – just read the call for workshops and fill in the workshop submission form (below). The deadline for workshop submissions is 10 June. We welcome highly interactive workshops, designed by/with voice hearers, inclusive of every way of thinking and being. The duration of the workshop is 1h30. It may be designed for audiences from 40 to 80 people. We will do our best to facilitate any setting aimed at completing the desired result. Workshops on spirituality are most welcome. As places are limited, you must register for the congress, Intervoice day and free events if you plan to attend. Registration will open at the end of June. See www.paris2016.revfrance.org. You must register for each event (i.e. intervoice day, public events and world congress) separately. Places are limited, so please register as early as possible if you would like to come. Intervoice are currently looking at ways of linking the congress and public events with people who cannot attend in person. We are an international movement with many members. 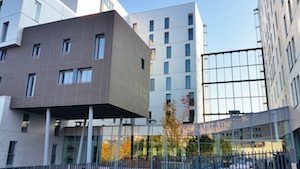 If you want to book a bed in a shared room, please contact Marie at paris2016@revfrance.org with the subject “Accommodation“. We’re excited to share details about a film created with the Bristol Hearing Voices Network that will be screened on Monday 27 June at 6pm (including an intro Q&A) as part of the Watershed Cinema’s ‘Psychosis on Screen’ season. To find out more, and book a ticket, see: www.watershed.co.uk/whatson/7319/in-the-real/, www.inthereal.org or www.bhvn.org.uk. The following is taken directly from the Watershed website and shared with the aim of raising awareness of this great initiative. For the past three years, filmmaker and psychoanalyst in training Conor McCormack has documented Bristol Hearing Voices Network – a self-help group for people who hear voices and have other unusual experiences. Strange and wonderful, intimate and emotionally affecting, In the Real is an observational collaborative documentary which goes to the heart of the voice-hearing experience. Who, or what, are the voices that only these men can hear? What do they say and what do they mean? And how does hearing voices transform their sense of self and world? Bristol filmmaker Conor McCormack (Christmas with Dad) gained access to this remarkable community of voice-hearers forged on the medicated margins of society. From outpatient clinic to riverside, bedsit to park bench, In the Real offers a rare insight into the inner logic of each character’s madness through the intimate moments of the everyday. By exploring the ways voice-hearers negotiate the complex deadlocks of psychosis and help each other to make sense of their unusual experiences, the film shows how, contrary to popular misconception, hearing voices can play a positive, creative and stabilising role in people’s lives. These are stories of resilience and survival, of loss and love, of the creation of a world outside the mainstream, a place where one can remain open to all kinds of human experience. These are powerfully emotive stories that explore the boundaries of human subjectivity, taking the viewer to a place where the available mental health discourses start to break down. In telling these stories, In the Real asks new questions about the nature and reality of mental health and illness. In the Real was supported creatively and financially by Hearing the Voice – an interdisciplinary study of voice hearing based at Durham University, funded by the Wellcome Trust. The film will be presented by Angela Woods from Hearing the Voice. Ticket prices: £4.50. Aged 24 or under? You can see any screening at any time for £4.50. A group of people who have, and still do, use mental health services, who work in mental health, or who are academics … or fall into more than one of those categories – decided to write an Open Letter to the BBC and other media organisations to raise their concerns about their recent coverage of mental health issues.